Lately I've been on a kick to try to use more of my scraps. 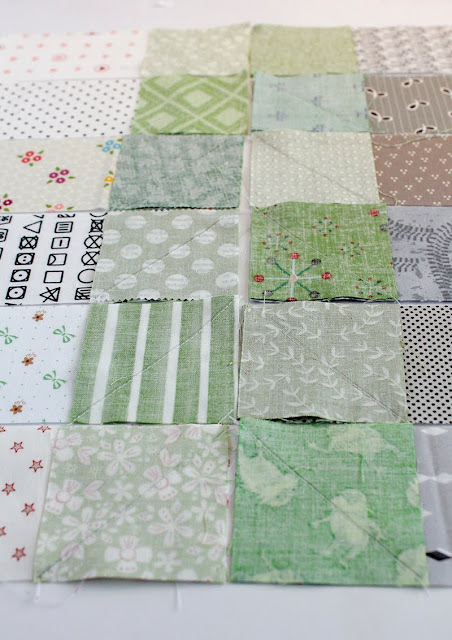 I have a lot saved up, and I'd love to start using them more in my quilts. 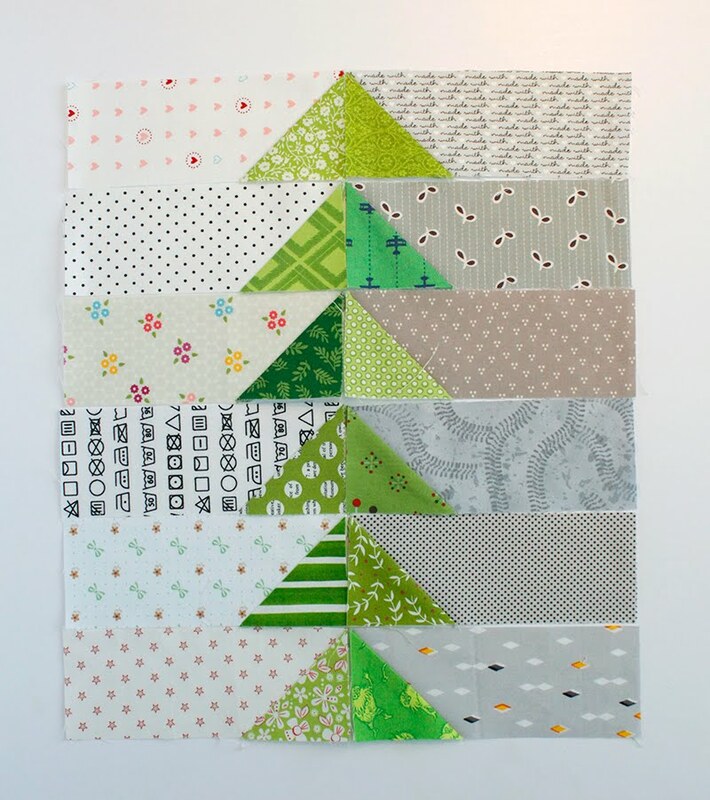 I designed this super scrappy flying geese block to use some low volume prints, gray prints, and some prints in your favorite color - (right now mine is green) and I named this block the Scrap Bin Geese block. Step 1: Using a pencil, draw a diagonal line on the wrong side of each of the 2.5" green squares. Step 2: Lay out all of the block elements as shown above, with the low volume strips on one side and the gray on the other. Decide where you want to place each green square. Step 3: Flip over the green squares so they are right sides together with the low volume / gray strips. At this point you want to make sure your drawn lines are going in the correct direction (see photo above). 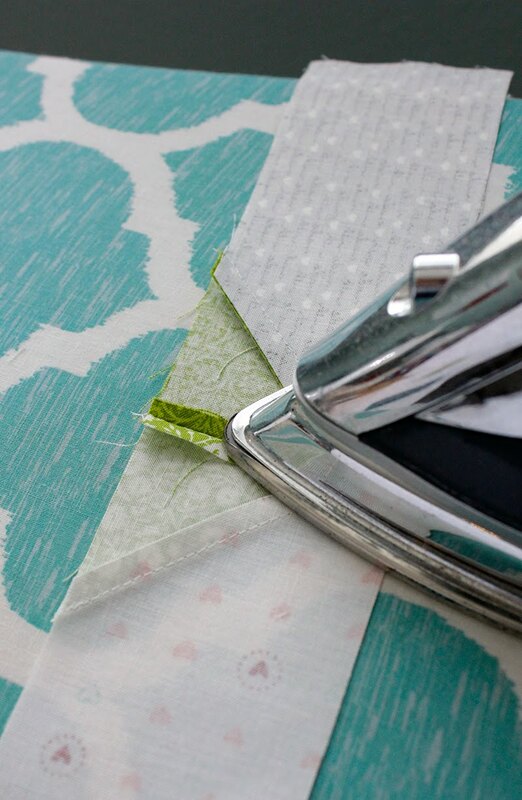 Step 4: Sew directly on the drawn lines. Step 5: Trim each seam allowance to about 1/4". Fold open each green triangle and press. Step 6: Next, sew sections of block together in strips, using a scant 1/4" seam allowance (see photo below). 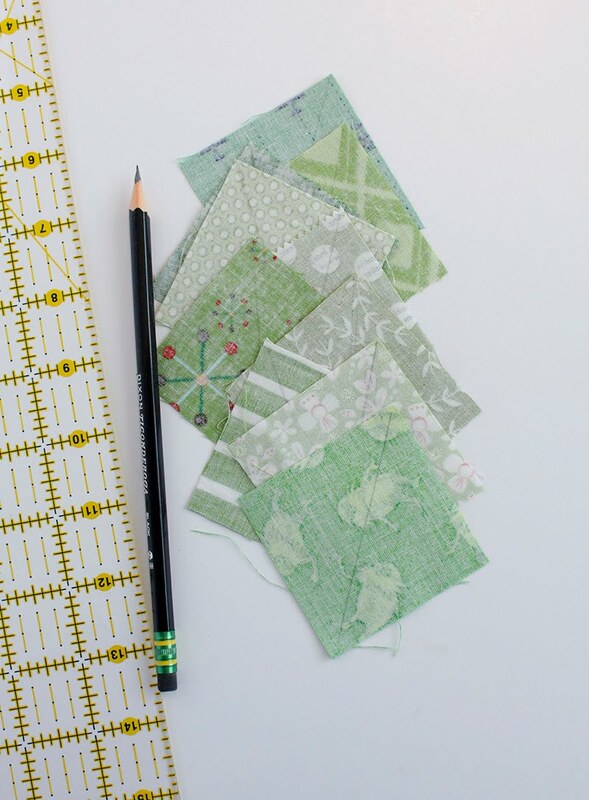 For example, sew strip 1 to strip 2, 3 to 4, 5 to 6, etc. Step 7: Sew rows together, using a scant 1/4" seam and matching up the center seams. Once all rows are sewn together, press seams. You can mix things up by swapping which side the gray prints are on like in the photo below. 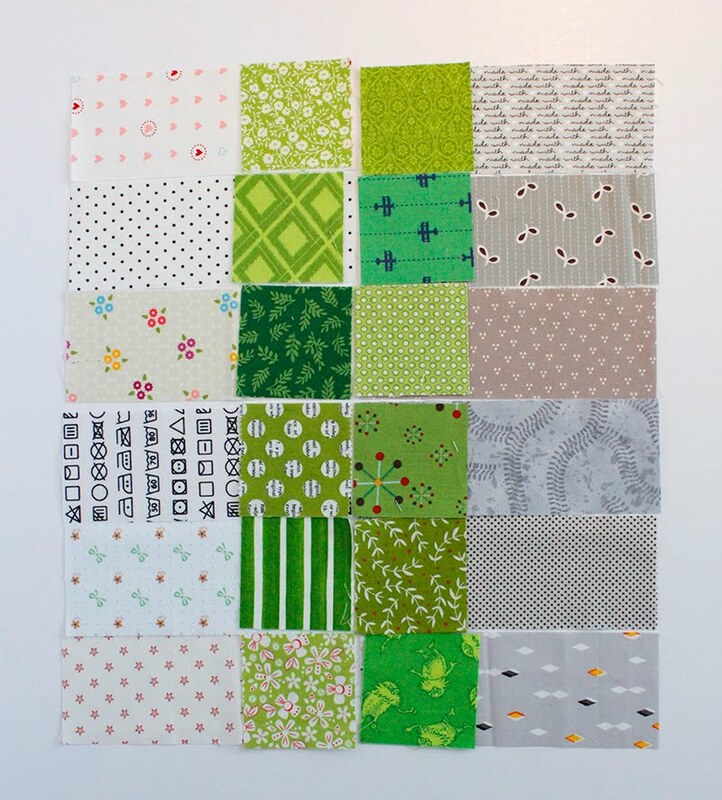 And here is a sample of what a whole quilt would look like! This is made of 30 blocks (6 rows of 5 blocks each) and would measure 60" x 72". It looks like I am the first to comment . . . Well, I must say, thank you for this tutorial. You made it so simple to follow along . . . I have been quilting for four years and still consider myself a beginner. I love trying new things and learning with each quilt and you are gracious and thoughtful to take the time to put this together . . . thanks again & Happy Quilting. Love this block! Of course, green is my favourite colour, and I love flying geese blocks! 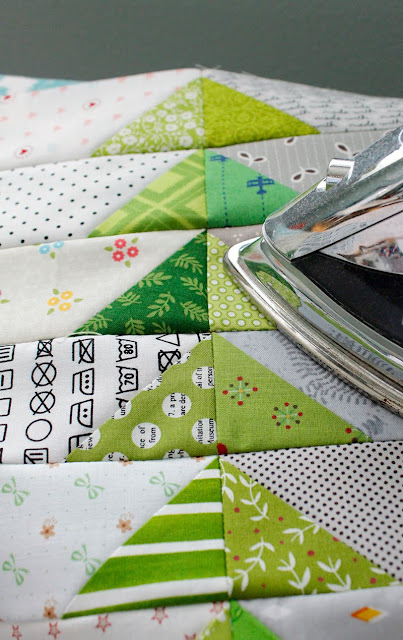 Thanks for pinning my scrappy sandwiches blocks/quilt! It is a fun block to make too! Thanks, Andy! You are the best at sharing. 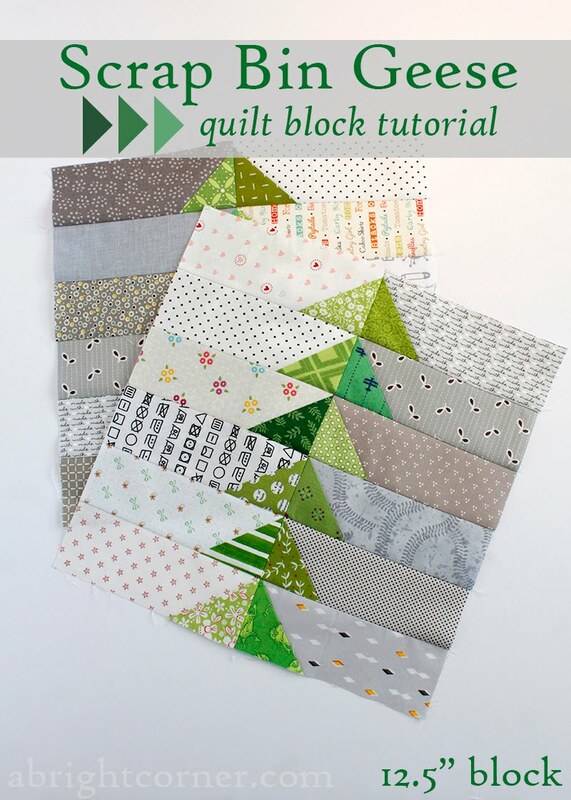 This is a really cute block design and makes a wonderful quilt too! Great idea for using scraps! Thanks for the inspiration. Re: Step 7, how do you sew the strips TOG w/out sewing through the points? Step6 shows the points at the very top of the strips, but step 7 shows the low enough to leave room for a 1/4" seam. The strips in the photo for step 6 are just placed next to each other and are not sewn yet. When you sew the strips together in step 6, it does create a 1/4" seam allowance at the top of each triangle. Sorry that's confusing. If I could go back in time I'd take another photo at that step to show what I mean. It does work out though! 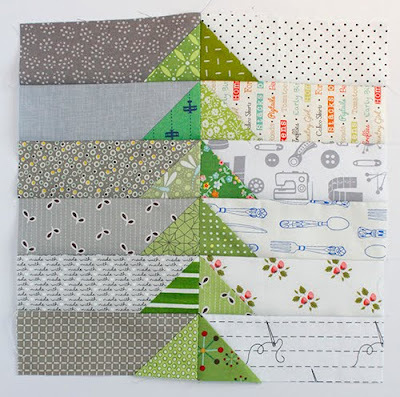 I'm also wondering the same thing as Marlene Clausen - how do you sew the strips without losing the points at the top of the geese? Nice clear tutorial though many thanks for sharing. This is the first time I've seen your blog. I loved your tutorial so much that I recommended it to my own blog readers. You can see my post here: http://quiltersdiary.com/scrap-bin-geese-quilt-block-tutorial/. I hope that's okay. I will be coming back often. 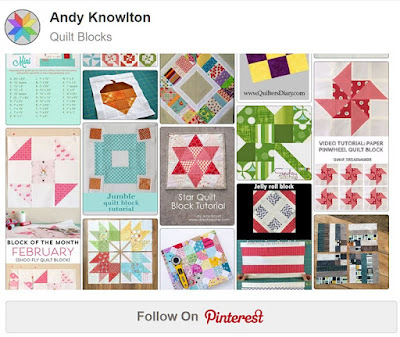 Thanks for the link Quilter's Diary! Brilliant tutorial! Love the fabrics too! Thank you! 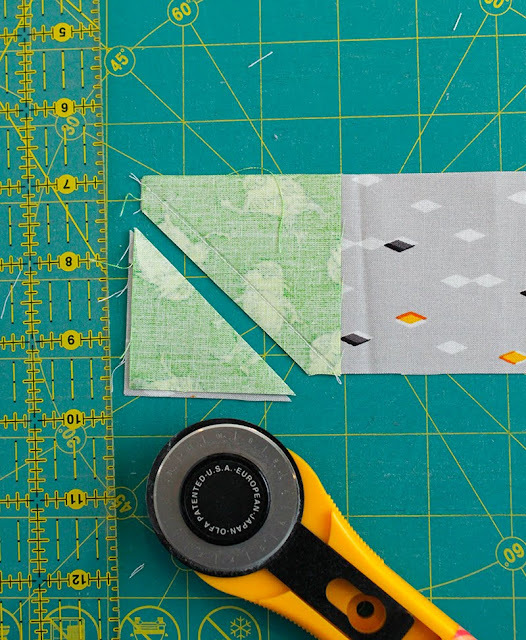 What is missing after step 6 is that you will have a 1/4" seam allowance above the point after you join the two strips together. It confused me too, but if you make a sample for yourself (always a good idea) you should come out fine. Very cute project! I absolutely love this block. I have a BOM Group on Facebook. May I use this block in March? Thanks! It does make a (1/4") difference! Amy, this is brilliant! I love new ways of using up those scraps. Thanks for sharing. I love this block! Thanks the tutorial and the sample layout. I can't wait to give this a try! Hi Andy, Love this block. I hope you don't mind if I use it as my Bee Block for Stash Bee. I can't wait to make this into a quilt. Thanks for posting this. Pinterest helpfully suggested this as "a pin you will love." Glad to discover the block, your blog, and your designs! Love this block and your color theme is wonderful! I love scraps and never throw them away. I've made quite a few scrap wall quilts recently and this one will be next. Thank you for a great tutorial. I absolutely love this block! I've made 3 from my stash and am planning an entire quilt around busting through my scraps. 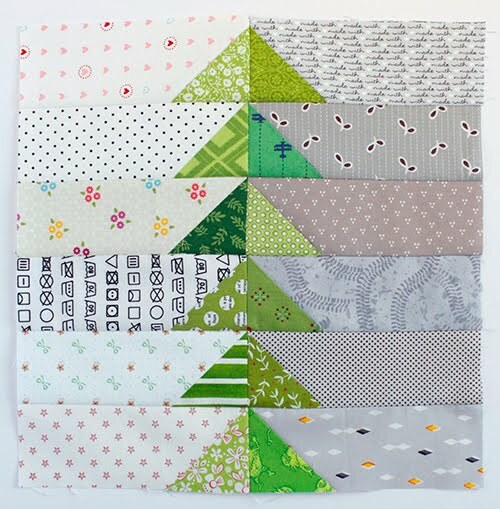 I hope you don't mind but I featured your blog and this particular block in our quilt guild newsletter. The ladies I sew with loved this block when I was making it. Your instructions are great! I don't mind at all - thanks for featuring me! I Love your block, and wanted you to know I think you have beautiful color and placement/values. I was thinking of making a quilt just like this recently, and now after seeing yours, I think I will. Thank you very much for the tutorial. Thanks for a very nice tutorial! I also appreciate the connection to your Pinterest board. What a wonderfully scrappy Block! Thanks for sharing! I made a quilt out of this block and it is one of my all time favorites. So, this morning I am looking at my computer instead of sewing on my three current projects. But I love this one. I will be making it for sure. 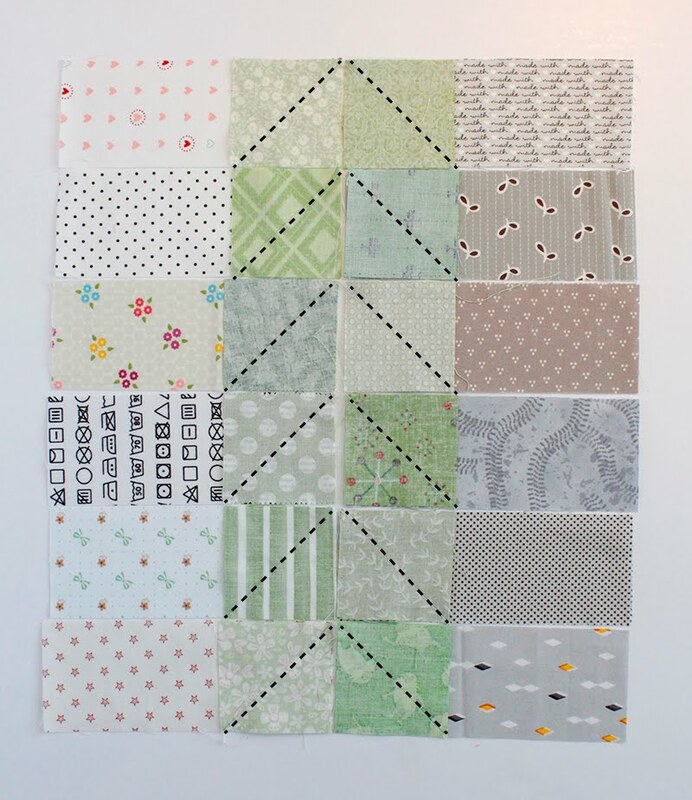 Maybe for the next great grandchild's baby quilt. Thank you! This came to me through a Pinterest email of suggestions. They were right! I love this block, quilt and easy tutorial. Thank you so much.